MALAYSIA have a string of agencies related to sports with a director-general at National Sports Council (NSC), chief executive officers (CEO) at National Sports Institute, Malaysia Organising Committee for Kuala Lumpur SEA Games and National Football Development Programme. There are directors at Anti-Doping Agency of Malaysia, National Stadium Board and Podium Programme. We also have a Sports Commissioner, the Sports Advisory Panel and Yayasan Kebajikan Atlet Kebangsaan (National Athletes’ Foundation) as well as highly paid consultants. Staffing is huge in many agencies with sports managers for respective sports association. Even national sports associations (NSAs) have engaged CEO and managers. Several sports have benefited but the majority are struggling in Southeast Asia and Asia regions and we still haven’t won an Olympic gold medal. Football was administered by a skeleton staff, but despite having more than 100 personnel today, has been a disappointment. There were many achievements which stood out in the past — like finishing fourth in the hockey World Cup in 1975. Our footballers played in the 1972 Munich Olympics and qualified for the 1980 Moscow Olympics only to join the boycott and miss the Games. 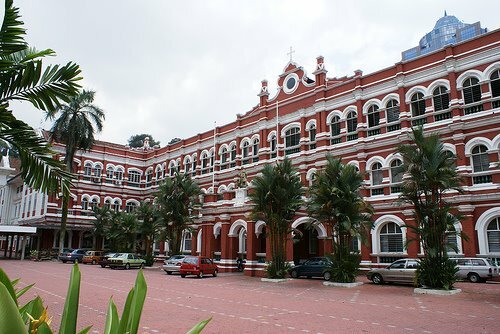 Athletics saw Tan Sri Dr M. Jegathesan and Isthiaq Mubarak shine, and badminton ruled with the likes of Eddie Choong, Wong Peng Soon, Ooi Teck Hock, Ong Poh Lim, Abdullah Piruz, Teh Kew San, Chan Kon Leong, Billy Ng, Tan Aik Mong, Tan Aik Kuan, Ng Boon Bee and Punch Gunalan to name a few. Today, we have shuttlers Lee Choong Wei, Goh V Shem, Tan Wee Kiong, Goh Liu Ying and Chan Peng Soon, synchronised diving duo Pandelela Rinong and Cheong Jun Hoong and cyclist Azizulhasni Awang who excelled at the Rio Olympics and Nicol David who has ruled the squash world. However, shouldn’t Malaysia have achieved better results based on how much has been invested and how professional the sports environment has moved on to? Officials were volunteers, worked out of their car boots and were not paid. Many associations had skeleton staff or were one-man shows, yet worked tirelessly with dedication and passion. 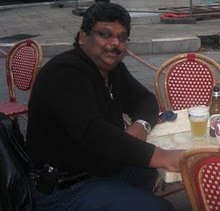 People like Datuk G. Vijayanathan and S. Satgunam (hockey), N.M. Vasagam, S. Kamalanathan, N. A. Baskaran, K. Aryaduray, Datuk G. S. Kler, Datuk S. Vegithuman (athletics), Datuk A. Vaithilingam, K. Balachandran, Abdullah Marzuki (schools sports), Shahruddin Jaafar, Datuk Mazlan Ahmad, Daud Kassim (cycling), Aziz Bokhari Bab and Shuaib Kasa (badminton), Edmund Yong (golf) Yap Yong Yih and Chan Foong Keong (table tennis), Lum Mun Chak, Datuk Yeoh Choo Hock (basketball), Sum Kwok Seng (weightlifting) and Datuk Paul Muragasu (football) to name few. 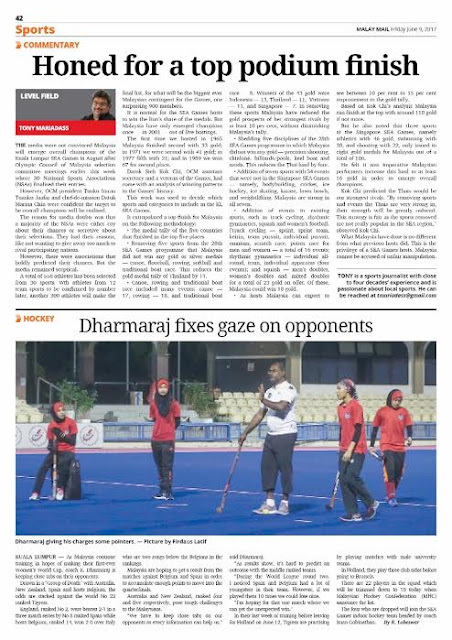 “MHF (now Malaysian Hockey Confederation) did not have an office to conduct business of the federation,” said Vijyananthan who was secretary from 1959 to 1985 under three presidents — Tun Abdul Razak, Tun Hussein Onn and Sultan Azlan Shah. “All secretarial work was performed at my house. The association did not even own any equipment. I bought a typewriter on instalment basis from my clerk’s salary. “I was not paid a single cent during my 26-year tenure,” said Vijyananathan. 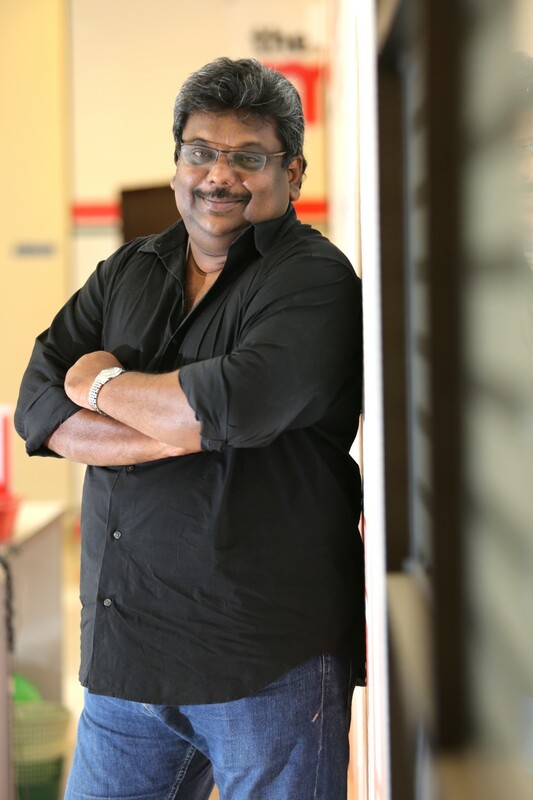 Satgunam was known for keeping files in his car boot which served as his filing cabinet. Today, NSAs have office space available from Olympic Council of Malaysia or NSC. Some have own buildings. Critics will be quick to say we cannot compare the past and present. The point is with limited resources, finance, facilities and volunteerism, sports was on a higher pedestal. Now, with high pay for foreign experts and consultants, we are struggling. Why? For starters, many NSAs have surrendered their responsibilities to NSC for convenience, while some who still hold on to their responsibilities do not engage enough. Yes they have joint committee meetings between NSC and NSAs, but more often than not, decisions are taken by NSC, as funders. If all parties wear one hat, have one common goal with total cooperation and understanding, then Malaysian sports will stop being short changed. 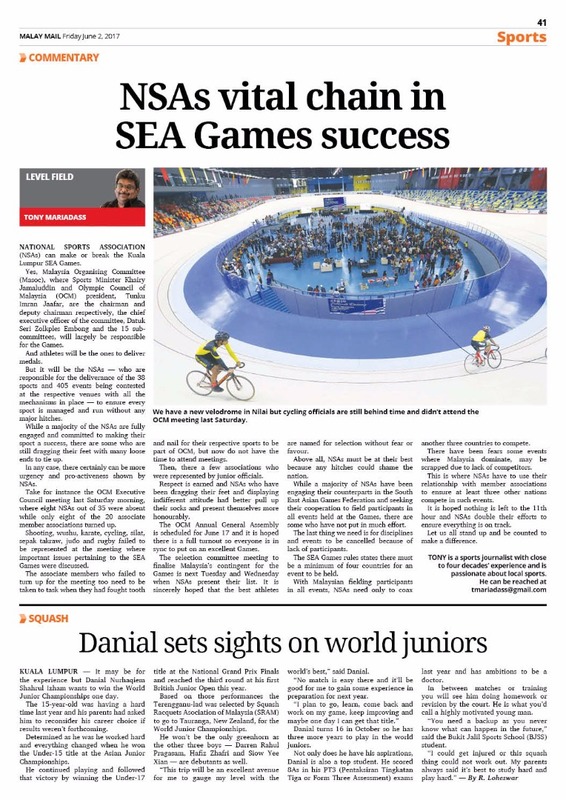 THE media were not convinced Malaysia will emerge overall champions of the Kuala Lumpur SEA Games in August after Olympic Council of Malaysia selection committee meetings earlier this week where 30 National Sports Associations (NSAs) finalised their entries. However, OCM president Tunku Imran Tuanku Jaafar and chef-de-mission Datuk Marina Chin were confident the target to be overall champions will be realised. The reason for media doubts was that a majority of the NSAs were either coy about their chances or secretive about their selections. They had their reasons, like not wanting to give away too much to rival participating nations. However, there were associations that boldly predicted their chances. But the media remained sceptical. A total of 558 athletes has been selected from 30 sports. Wth athletes from 12 team sports to be confirmed by number later, another 300 athletes will make the final list, for what will be the biggest-ever Malaysian contingent for the Games, one surpassing 900 members. 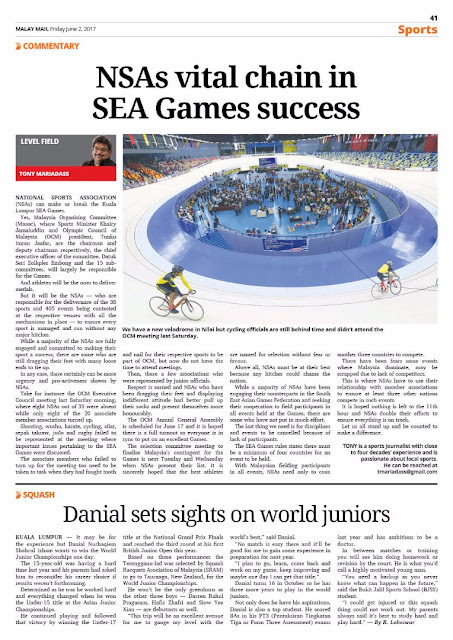 It is normal for the SEA Games hosts to win the lion’s share of the medals. But Malaysia have only emerged champions once — in 2001 — out of five hostings. The first time we hosted in 1965 Malaysia finished second with 33 gold; in 1971 we were second with 41 gold; in 1977 fifth with 21; and in 1989 we won 67 for second place. Datuk Sieh Kok Chi, OCM assistant secretary and a veteran of the Games, had come with an analysis of winning patterns in the Games’ history. This work was used to decide which sports and categories to include in the KL SEA Games. • Removing five sports from the 28th SEA Games programme that Malaysia did not win any gold or silver medals — canoe, floorball, rowing, softball and traditional boat race. This reduces the gold medal tally of Thailand by 11. • Canoe, rowing and traditional boat race included many events: canoe — 17, rowing — 18, and traditional boat race — 8. Winners of the 43 gold were Indonesia — 13, Thailand — 11, Vietnam — 11, and Singapore — 7. 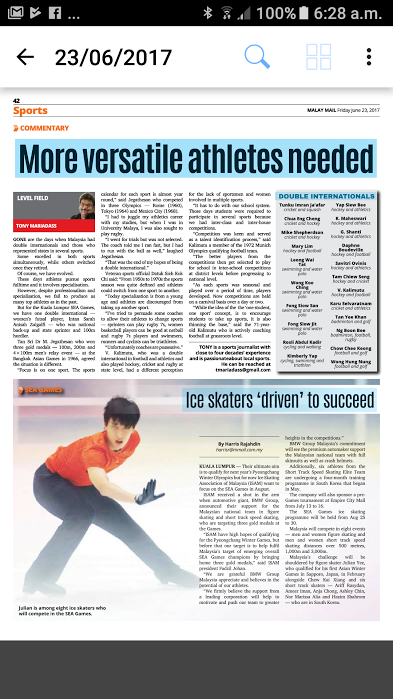 In removing these sports Malaysia have reduced the gold prospects of her strongest rivals by at least 10 per cent, without diminishing Malaysia’s tally. • Shedding five disciplines of the 28th SEA Games programme in which Malaysia did not win any gold — precision shooting, chinlone, billiards/pools, keel boat and sanda. This reduces the Thai haul by four. • Addition of events in existing sports, such as track cycling, rhythmic gymnastics, squash and women’s football. (Track cycling — sprint, sprint team, keirin, team pursuit, individual pursuit, omnium, scratch race, points race for men and women — a total of 16 events; rhythmic gymnastics — individual all-round, team, individual apparatus (four events); and squash — men’s doubles, women’s doubles and mixed doubles for a total of 23 gold on offer. Of these, Malaysia could win 18 gold. • As hosts Malaysia can expect to see between 10 per cent to 15 per cent improvement in the gold tally. But he also noted that three sports at the Singapore SEA Games, namely athletics with 46 gold, swimming with 38, and shooting with 22, only issued in eight gold medals for Malaysia out of a total of 106. He felt it was imperative Malaysian performers increase this haul to at least 16 gold in order to emerge overall champions. Kok Chi predicted the Thais would be our strongest rivals. 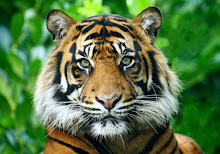 “By removing sports and events the Thais are very strong in, their strength will be greatly reduced. This strategy is fair as the sports removed are not really popular in the SEA region,” observed Kok Chi. What Malaysia have done is no different from what previous hosts did. This is the privilege of a SEA Games hosts. Malaysia cannot be accused of unfair manipulation. NATIONAL SPORTS ASSOCIATION (NSAs) can make or break the Kuala Lumpur SEA Games. Yes, Malaysia Organising Committee (Masoc), where Sports Minister Khairy Jamaluddin and Olympic Council of Malaysia (OCM) president, Tunku Imran Jaafar, are the chairman and deputy chairman respectively, the chief executive officer of the committee, Datuk Seri Zolkples Embong and the 15 sub-committees, will largely be responsible for the Games. And athletes will be the ones to deliver medals. But it will be the NSAs — who are responsible for the deliverance of the 38 sports and 405 events being contested at the respective venues with all the mechanisms in place — to ensure every sport is managed and run without any major hitches. While a majority of the NSAs are fully engaged and committed to making their sport a success, there are some who are still dragging their feet with many loose ends to tie up. In any case, there certainly can be more urgency and pro-activeness shown by NSAs. Take for instance the OCM Executive Council meeting last Saturday morning, where eight NSAs out of 35 were absent while only eight of the 20 associate member associations turned up. Shooting, wushu, karate, cycling, silat, sepak takraw, judo and rugby failed to be represented at the meeting where important issues pertaining to the SEA Games were discussed. The associate members who failed to turn up for the meeting too need to be taken to task when they had fought tooth and nail for their respective sports to be part of OCM, but now do not have the time to attend meetings. Then, there a few associations who were represented by junior officials. Respect is earned and NSAs who have been dragging their feet and displaying indifferent attitude had better pull up their socks and present themselves more honourably. The OCM Annual General Assembly is scheduled for June 17 and it is hoped there is a full turnout so everyone is in sync to put on an excellent Games. The selection committee meeting to finalise Malaysia’s contingent for the Games is next Tuesday and Wednesday when NSAs present their list. It is sincerely hoped that the best athletes are named for selection without fear or favour. Above all, NSAs must be at their best because any hitches could shame the nation. While a majority of NSAs have been engaging their counterparts in the South East Asian Games Federation and seeking their cooperation to field participants in all events held at the Games, there are some who have not put in much effort. The last thing we need is for disciplines and events to be cancelled because of lack of participants. The SEA Games rules states there must be a minimum of four countries for an event to be held. With Malaysian fielding participants in all events, NSAs need only to coax another three countries to compete. 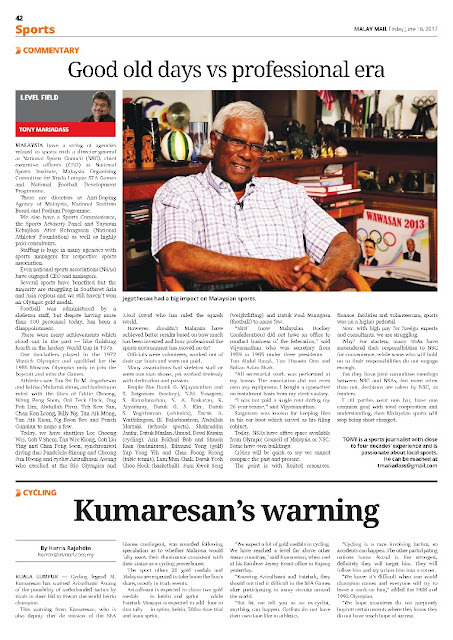 There have been fears some events where Malaysia dominate, may be scrapped due to lack of competitors. This is where NSAs have to use their relationship with member associations to ensure at least three other nations compete in such events. It is hoped nothing is left to the 11th hour and NSAs double their efforts to ensure everything is on track. Let us all stand up and be counted to make a difference.